Seraph011 wrote: Anong part ba ng timeline papasok to? Kasi yung sa psp parang hindi pa din masyado natuloy from where part 2 left off. may nabasa ako before eto yung kadugtong talaga ng 2. Sana nga..hanggang ngayon bitin pa din kasi yung 2 eh. The interview from Famitsu has a longer section for Kingdom Hearts 3D: Dream Drop Distance, which reveals a wireless Dream Eater battle mode. Dream Eaters are new critters in Kingdom Hearts 3D that players can train and fight with. 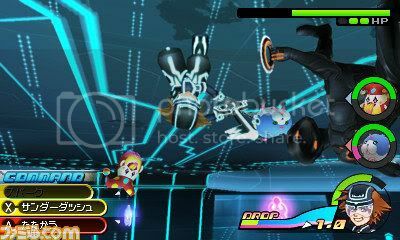 The multiplayer mini-game will use a different battle system and these fights can upgrade Dream Eaters for the main story. Nomura says the game will use ad-hoc connectivity, which means its local play. Concerning Organization XIII, Nomura said a secret about the hooded group will be revealed. Players will see Zexion, Lexaeus, and Axel in Kingdom Hearts 3D as humans with memories of their time being nobodies. 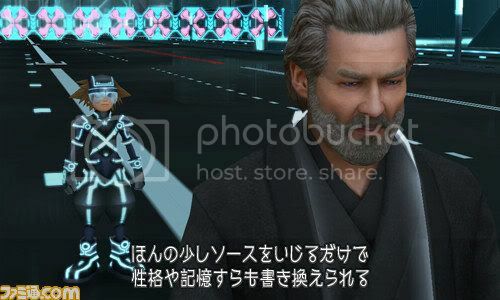 A mysterious man wearing a black coat from Kingdom Hearts: Birth by Sleep Final Mix will be in Kingdom Hearts 3D too. 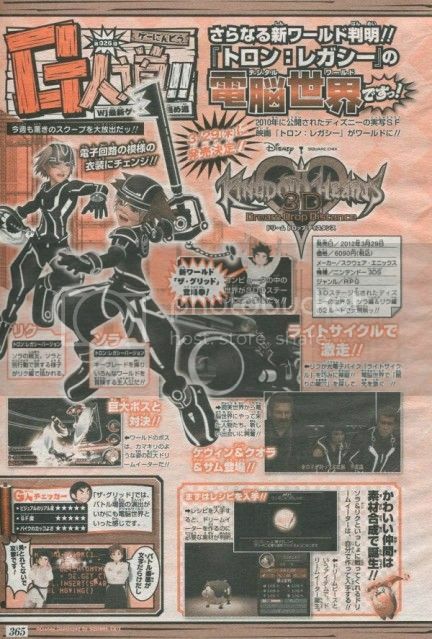 Speaking with Famitsu, Tetsuya Nomura confirmed Kingdom Hearts 3D: Dream Drop Distance will have a secret movie. 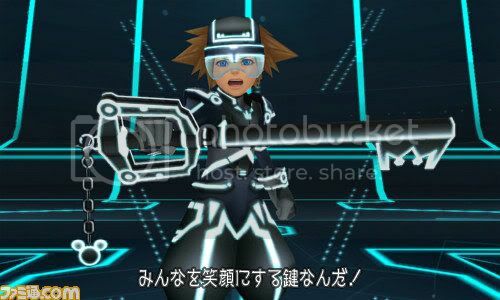 Like the secret movie in Re:Coded, it will connect to the next game in the Kingdom Hearts series. He told the magazine this ending will have a shocking revelation. The regular ending, Nomura says, will be a different direction from the rest of the series. In Kingdom Hearts 3D: Dream Drop Distance, players control Sora and Riku who are taking the Mark of Mastery Exam to become Keyblade Masters. Worlds in this game are sleeping and players need to wake them up, with the help of Dream Eaters, to restore them. Nomura also mentioned Japan will get a second downloadable demo of Theatrhythm: Final Fantasy. The first demo included one song from Final Fantasy VI. ...may 3DS bundle daw to. saka may "the world ends with you" na story/stage na isasama sa game. Square Enix confirmed that Kingdom Hearts 3D: Dream Drop Distance will be out in Japan on Mar 29, for 6090 yen. In addition, two special edition of the game will be available on the same date. The first is a 3DS + Kingdom Hearts 3D Bundle Pack, which comes with a Kingdom Hearts Edition of 3DS; the second is a Kingdom Hearts 10th Anniversary Box, content will be revealed in future. Tibarn wrote: ...may 3DS bundle daw to. saka may "the world ends with you" na story/stage na isasama sa game. W/L > K/D Parang basketball lang yan! Ang taas nga ng score mo talo din naman! Square Enix announced the "Kingdom Hearts 10th Anniversary Box" for Kingdom Hearts 3D last week, but did not say what goodies we'd find inside. The details came today. The box includes three games: Kingdom Hearts 3D, Kingdom Hearts 358/2 Days and Kingdom Hearts Re:Coded (the latter two are for the DS). It also includes a protect cover and a set of twelve post cards featuring cover art from past Kingdom Hearts games. Sana may US and matte finish..
Tibarn wrote: ...magkano kaya to? Pricing for the box is set at ¥15,000. Square Enix also revealed pricing for the Kingdom Hearts 3DS hardware bundle that was announced last week: ¥21,090. yung "box" ba yung may 3 games na kasama na 15k Yen? tapos 21k Yen yung 3ds kh edition? 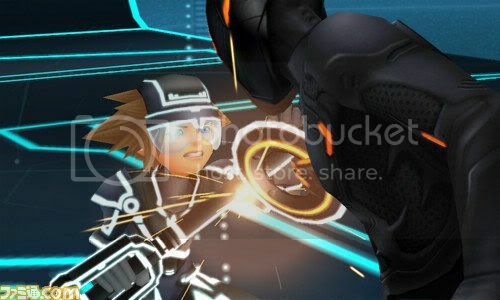 One of the new moves in Kingdom Hearts 3D: Dream Drop Distance is the reality shift, which has players pull out the stylus to attack. 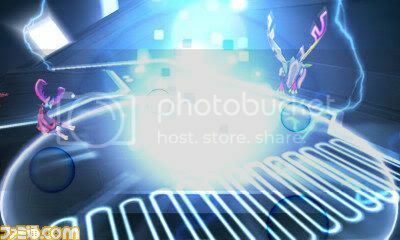 Players can activate a reality shift by pressing X+A when a pink marker shows up on the touch screen. The Reality Shift you do depends on what world you’re in. "Slingshot" is Traverse Town’s Reality Shift. You use "Holy Rope" in La Cité des Cloches and "Wonder Comic" turns the world into a comic book in Country of the Musketeers. In December, Square Enix announced a 2012 release for Kingdom Hearts 3D: Dream Drop Distance in North America and Europe, but didn’t say when or how far along they were in the localization process. Reports this week indicate that English voice-recording sessions for Kingdom Hearts 3D are well underway, with some of the cast already having wrapped up their work on the game. KHInsider report that Vincent Corazza, who reprises his role as Zexion in the game, is done with recording. Additionally, Jesse David Corti, the voice-actor who played Neku in The World Ends With You, is recording for the same character for Kingdom Hearts 3D as well. A week ago, Corti revealed over Twitter that was “about finished” with recording his lines. Also: create new Dream Eaters. 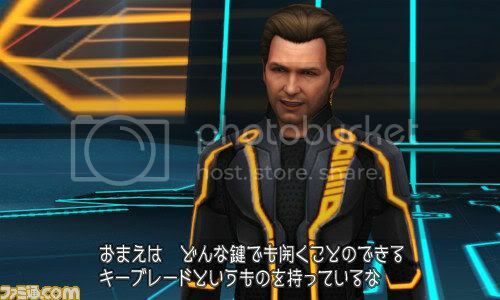 The Tron: Legacy-based world in Kingdom Hearts 3D is known as “The Grid,” this week’s issue of Jump has revealed. 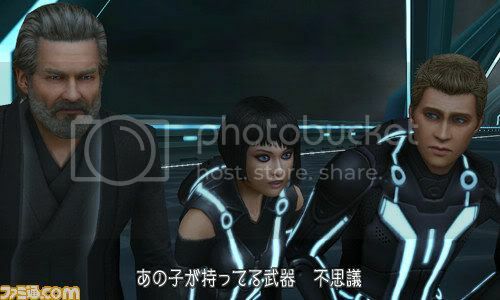 Tron: Legacy protagonist Sam Flynn, his father Kevin Flynn, and his apprentice Quorra can be seen in the scan. 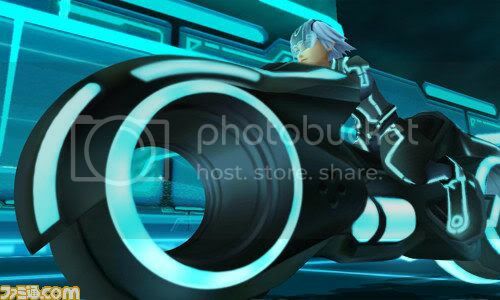 Riku is also seen riding a Light Cycle. Outside of “The Grid,” the magazine also has details on a new system for Dream Eaters. By collecting and combining certain “Dream Pieces,” you’ll be able to create new Dream Eaters. But first, you’ll need the corresponding recipe. Square Enix has provided a first look at the content of the Kingdom Hearts 3D 10th Anniversary Box. 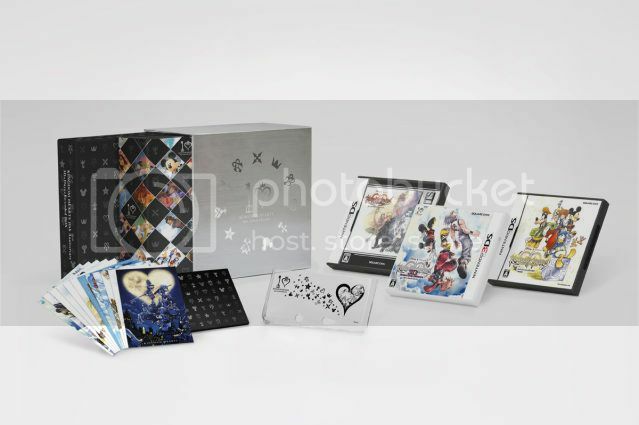 The ¥15,000 box includes KH3D, Kingdom Hearts 358/2 Days and Kingdom Hearts Re:Coded, along with a protect cover and twelve post cards, all in a special box. ...tron legacy screens. parang lalong gumaganda graphics nito a. The Tron Legacy world is called "The Grid." Sora and friends wear special attire and hold a special Keyblade in this world. They'll meet up with characters from the movie, including Kevin Flynn, Sam Flynn and Quorra. Cool..too bad i didn't like the movie. ...me too, mas gusto ko pa yung original. pero ganda pagkakagawa nila dyan kay jeff b.